At the moment I am loving dressing up Bubba in cute little tops and trousers and there is an abundance of patriot attire currently in the shops. The only problem is that its mostly blue (well not a problem for us) and other people keeping mistaking her for a boy (again not a real problem but I'm never sure whether to go along with it or correct them) - if I play along and they realise she is a 'she' then I look like a loony liar, if I point out their mistake then I end up looking like the overly sensitive mother. To be fair, I often can't tell if a he is a he or she and a baby looks very much the same as every other baby so I'm still going to put her in blue's and dark colours. What with the Jubilee celebrations, it was another excuse to get her in red, white and blue and to top it off we tried out a headband for fun. As you can see, she wasn't overly keen on the headband. I love this little union jack T-shirt and wish that it also came in my size. 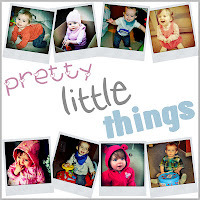 I'm linking this up with Hollybobb's and Love from Mummy, so go over and check out the other Pretty.Little.Things. I'm already over excited for next weeks theme which is 'first photo'.